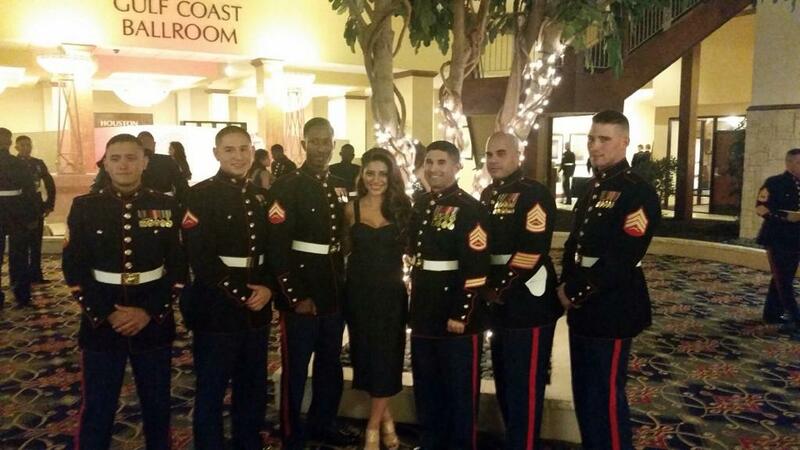 Mayra was an honored guest at the 239th Marine Corps Ball in Houston and the Cake Cutting Ceremony at the Michael E. DeBakey VA Medical Center to honor disabled Marines and Veterans. What an awesome weekend with the Houston Marines and Mayra Leal for 239th Marine Corps Birthday Ball and Michael E. DeBakey VA Medical Center Cake Cutting to Honor our Marines and Veterans. Thank you all who posted, shared, called, and texted. Thanks again for the companies who supported: Philis Santello-Christensen, Broker/Franchise Owner for ITEX Houston, R and R Partnership, Inc. (limo and airport service) (www.RandRPartnershipInc.com), Brennan’s of Houston with Chef Carl Walker (former Marine), Fashi…on Designer Chloe Dao and Sydney Dao (www.ChloeDao.com), Fearless Networker Ken P. Marsh, Sheila Sheila Jean White Harrison of The Entrepreneur Broadcasting Company, Inc., Hector Luna of C47Houston News and Entertainment Magazine, Bruce Glasgow with Sikk Shades by Eddie Bauer, Jr., Charles Ynman, Senior Vice Commandant of the Marine Corps League (Texas), Joe Omar for Hair and Makeup for the ball, UNO Productions, Cindy Morataya for makeup on Sunday, the Houston Marine Coordinating Council, and Marketing Dynamics.